Air duct cleaning services for Northwest Indiana. 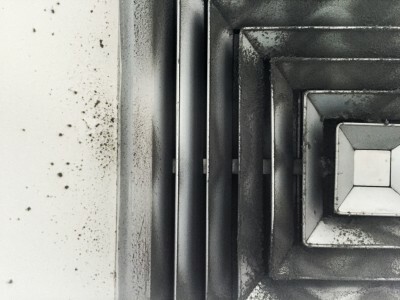 Over time, air ducts can become contaminated with mold, fungi, bacteria, and dust. In a typical six-room home, up to 40 pounds of dust is created annually through everyday living! Your heating and cooling system is the lungs of your home. The system takes air in and breathes air out. The contaminants built up in the air ducts are pulled into the HVAC system and re-circulated 5 to 7 times per day, on average. Contaminants in the heating and cooling system cause it to work harder and shorten the life of your system. That extra work compromises the energy efficiency of your home or business. When an HVAC system is clean, it doesn’t have to work as hard to maintain the temperature you desire. As a result, less energy is used, leading to improved cost-effectiveness. Call today to schedule a duct cleaning appointment! Our duct cleaning appointments are typically scheduled two weeks in advance. Cleanings start at $350 for 11 openings (supply or return). Each additional opening costs $30. It is also the perfect time to have us clean your dryer vent. Our equipment is perfectly suited for the job, and it can dramatically reduce your risk of a dryer vent fire. Dryer vent cleaning is $250, but when you schedule it along with a duct cleaning appointment you will receive a $50 credit. We use Rotobrush’s Air Duct Cleaning Machines and systems to properly remove unwanted contaminants and improve your indoor air quality. Our duct cleaning process goes one step further by using Rotobrush’s sophisticated video inspection equipment. The video inspection equipment allows us show you the dirt and debris deep inside your vents. Our Rotobrush equipment is also used for inspecting and cleaning dry vents. Lint and debris can build up in your clothes dryer duct, impacting efficiency. This creates potentially hazardous conditions including the increased risk of fires. A blocked gas clothes dryer can also force carbon monoxide back into your home. An annual inspection and cleaning by Buck's Heating and Air can keep your dryer venting efficiently and safely. Our goal is to make sure that your home is the safest and most comfortable place for you and your entire family. We provide you with superior HVAC systems services to ensure that your systems are functioning at their optimum level at all times. Buck’s Heating and Air will also work with you to make sure that you are breathing in excellent air quality in your home. Call us at 219-406-8758 today for more information and to schedule your duct cleaning appointment.